Random House Trade Paperbacks, 9780812978001, 416pp. Driven from the only home he has known during Ireland’s Great Hunger of 1847, Fergus O’Brien makes the harrowing journey from County Clare to America, traveling with bold girls, pearl boys, navvies, and highwaymen. Along the way, Fergus meets his three passionate loves–Phoebe, Luke, and Molly–vivid, unforgettable characters, fresh and willful. 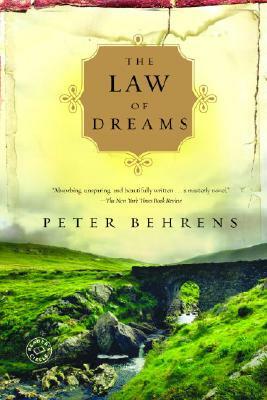 Based on Peter Behrens’s own family history, The Law of Dreams is lyrical, emotional, and thoroughly extraordinary–a searing tale of ardent struggle and ultimate perseverance. Peter Behrens's first novel, The Law of Dreams, won the Governor General’s Award, Canada’s most prestigious book prize, and has been published in nine languages. The New York Times Book Review called his second novel, The O’Briens, “a major accomplishment.” He is also the author of the novel Carry Me and two collections of short stories, Night Driving and Travelling Light. His stories and essays have appeared in The Atlantic, The New York Times, and many anthologies. Awards he has received include a Wallace Stegner Fellowship in Creative Writing at Stanford University. A native of Montreal, he is currently a fellow at Harvard University’s Radcliffe Institute for Advanced Study.